I LOVE the double polka dots. I am anew follower. Lovely! I am a big fan of the polka dots, just a few days ago, as you know, I did a post about it:) I love following you, you have a great taste in fashion! Simply darling - love, love, love the different sizes of polka dots. This is a very cute outfit. Great blog, hun! Too old for polka dots!? Never, you look so chic! I'm following you right now on Google Friend Connect №30 & Bloglovin №6!!! Love the dots on dots - that tee is amazing! Thank you for leaving lovely comments! You really made my day! 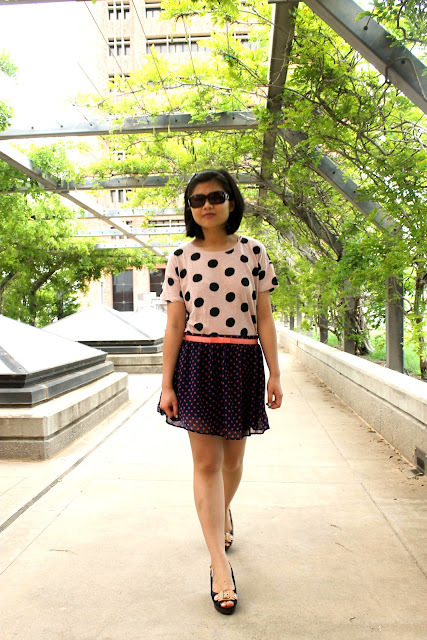 I love this polka dot look! It looks amazing on you too. Love it!! Didnt know Polka dots were for older people!! What a great outfit! I love your cute skirt and your polka dot shirt and shoes go perfectly with it!! Thumbs up! Great style! oh wow, i like this outfit... i love polka dots so much and you rock it so well! I like the two polka dots together! Very cute - love the dot on dot look! Love the combination, very cute look! Usually polka dots on polka dots is hard to match but I'm glad that the dots are two different sizes and colors. So cute!